I have a lot of old, vintage canning jars. I love the history they carry as well as their charm and character. While it is okay to use them for storage or even as a refrigerator container, you should never process old jars in a canner. The old glass can’t take the temperature change and might shatter – which would be such a shame. Plus, the old fashioned sealing method is not reliable. But vintage jars are great on your pantry shelf to hold grain, etc. So if you have some old jars, how do you know their true age? If you have a Ball jar, you can date most of them just by looking at the logo. 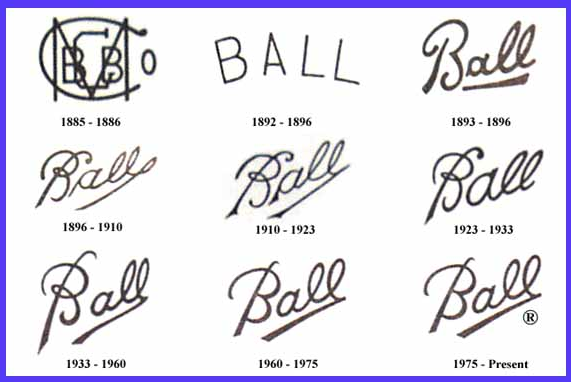 Every few years, the Ball Manufacturing Co changed the logo and if you compare yours to a reliable chart, you know how old it is. All you need is a chart like the one below. I found this great chart on Pinterest but unfortunately, it had lost it’s original link to the source. At one point, I found what claimed to be the original source and linked to it here. But in the last 6 months or so, that site went down and never came back. The URL no longer works. So if someone does know the original source, please reply in the comments so I can relink. Thanks bunches! PLEASE NOTE: I am getting a lot of emails and questions in the comments about the value of people’s jars. I’m not an expert in this area and I cannot tell you the value of your jar. Your guess is as good as mine. I just love to collect them. Their value to me is sentimental. If you have an old jar you want to sell, I suggestion you check on ebay to see what similar jars are selling for. Good luck! We never can in our old jars that we inherited from hubby’s dad, but now we can at least date them. Woohoo! Thanks! You are welcome Teresa. It was so fun to see how old some of mine were. I need to check my mom’s. She has some REALLY old ones for sure. I have one in the 1910-1923 range too Teresa! Very exciting. It is an amazing thing to think of all the use those jars had and the things those women put up back in 1922. That was real organic food. They would probably not believe that to grow and preserve real food like that now requires special effort and attention. To them…it was just food! I have a huge collection of Mason jars! My oldest Ball jar is 1900-1910. I’ve got 2 different styles & colors from that decade. I’m trying to find a chart to date my Kerr & Hazel Atlas jars! Any ideas? I will be 90 years old on Occtober 1, 2014 and I have a jar of pear preserves that my mother canned the day I was born. It is still sealed and the pears still have some liquid. Wow! She must have been some canner! That’s awesome! Happy belated birthday! Evelyn, that is amazing! Not just that you still have a jar of mom’s preserves, but that she was canning ON THE DAY SHE GAVE BIRTH! Not only was she some canner, sounds like she was plaint something! This is so amazing. My mom and her family were from Muncie where Ball Corp. was based. These Ball jars are very sentimental to me and my brother (my little sister notsomuch lol). I just found out that the one I just bought my brother for his birthday is from the 1923-1933 period. Having no prior knowledge before seeing this site, I am very happy to give it as a gift (filled with peanut M&Ms, of course. Thank you for the in formation. Hey Theresa — this has made the rounds a bit, but I think it’s important to note the source (http://home.earthlink.net/~raclay/DatingBalljars.HTML), where he expressly requests that people not just repost the image. I’m sure he’d appreciate a link back and props. Thanks! Sean – Thank you SO much. I tried to follow back the links on Pinterest so I could give credit, but it only went to other blogs who said they got it off Pinterest. I could not find the original source! I am amending my post now. Thanks again for the heads up! I received that Ball dating chart off of the Ball Facebook page. I have a variety of canning jars and have LOTS of questions. Some are ATLAS jars. What can you tell me about them? If I were to put them (2 qt) in a garage sale, what could I fairly ask. I also have some 2qt Ball jars with circles on the bottom and a it y circle with an A off set .there is also another A and a 4 near the bottom edge. The blogger that writes there has great info on his blog. Check it out! Hopefully he will have your answers. I have a question about a mason jar that I have, from what I have seen about as to the year it might be from 1933 to 1960. It is larger then most I have seen, guess somewhere about 3 gal. I can send pictures. I would like to know much money it could be worth. I’m not an expert on the value of old canning jars. I am just a curious collector. I really don’t know how much your jar would be worth, but it sounds very unusual. Have you tried looking for a similar jar on ebay? Or maybe you could post your question on a canning/preserving forum? I wish I knew where to send you, but I don’t! My guess is that a jar of that size would be very rare. I have a box of old jars. I have looked at your description of how Ball was written and I have one that is 1910-1923 and two are 1923-1933. Explain to me about the blue color vs clear and also the ones with wire closures vs screw tops. I also find these very interesting knowing that someone did can vegetables/fruit/meat in these and their family survived cold winter months off the food. I know what you mean! It is pretty amazing to hold that kind of history in your hands. I’m sorry but I don’t know anything more about the colors or the closures. I’m not an expert. I just like to collect them for fun. Maybe you could google about the colors? I’m sure someone out there knows! The natural color of glass, when blown, was aqua (due to the iron content in the silica used). Ball gradually refined this to a deeper shade of blue, called “Ball Blue” by collectors, which was phased out in the late 1930’s, other than some limited-edition sets produced in the 70’s and beyond. Clear jars from pre-WWI were made by using a compound to clarify them that, when exposed to years of sunlight, turned the glass an amethyst color. After the supply was disrupted in WWI, glassmakers used a different compound which tended to turn the glass a straw or honey color after prolonged exposure to sunlight. Glass manufacturers today have ways around this to achieve zero coloration. Wire bail jars started going into production in the 1880s, and the tech was predominantly used with beer and liquor bottles. They were known as “lightning” jars because they were extremely easy to open- fast. Thank you SO much Ted for all this great info!! Great information. I have some canning jars with the wire closure. What would this time be if you know? Also, what is a good reference to what these jars are actually worth. The Red book? Did not know wheather to pay the $40.00 to purchase it or not. I am no expert. I just came across the info in this post and shared it because I have a few old jars myself. According to the comment above yours, the wire bale jars went into production in 1880’s but I have absolutely no idea when they stopped making those. Wire-bail styled-jars (made by Ball at least) stopped being made for canning use around 1962. Several limited-edition special runs have been made, starting with the bicentennial in 1976. The most recent run was made in the early 90’s, but made by one of several independent glass conpanies for Ball Corporation, as over the years they had eliminated the capacity to manufacture blue-tinted glass. These can be differentiated easily, as the words “not for home canning” will be embossed somewhere in the glass. The patent date often found on many jars doesn’t refer to the age of the jar at all, it just refers to when the style of closure (zinc cap/wire bail, etc) was developed and registered. It’s sort of weird that a 22 year old who has never canned knows this, but I work at the company which was spun-off when Ball exited the home-canning market (who now makes amd markets the jars), Jarden Home Brands. I have a pretty cool collection of vintage jars too- from 1892-1930’s, mostly. Hope this info is mostly informative! Also, the Red Book is a good source but you might be better off looking at eBay Buy-it-now or auction prices. This is what we mostly do in the office as we don’t keep track of jar value officially. Thank you for the info !! I’m looking for a gift for a friend. Possibly a book about the history and worths of canning jars. Does anyone have a book they would recommend? Thanks for your help! I don’t know of any Kristen. But hopefully someone else here will know of something! Hi, I have an old Ball Jar, and was wondering if it’s worth. I can send you a pic, just reply with your email, and I’ll send a shot. I;m sorry, but I would have no idea what it is worth. Like you, I just like old jars. I am not an expert. I just wrote this post because I came across the info on how to tell how old they are. Maybe you can check on ebay. I have about twenty of my Great-grandmother, and my grandmothers Mason jars, so far, as I have checked; they are in the 1910-1923 years. I have always loved these jars. I thought the color was so pretty. I inherited my grandmothers jars; I purchased my great-grandmothers, jars from a family member. I am so thankful that I have the pleasure of owing them. Just think; Ball Mason Jars used by mother, and daughter; to me that is a treasure in itself. My grandmother (b. 1900) was given a jar of jelly from my great-grandmother in the 1930s. Grandma gave the jar to me a number of years ago. I have kept it on a shelf and recently it was broken. The lid is marked ” the upress it cap” and is quite unique. I would love to replace the jar. Can you tell me anything about the jars these lids fit on? So sorry to hear that your beloved jar was broken. I’m sure it made your heart ache. I don’t know anything about those jars. I suppose you could look on ebay. I wish I could help you somehow but I am at a lose as well. I have some old mason jars with a glass lid and a tin ring. Any idea how old they might be? I’m sorry Nancy. I don’t know. Wish I did. You might try looking on Ebay to see if you can find others like it. Good luck! Hi, do you have any purple canning jars for sale, or any bale jars? Thanks! I have a clear canning jar that says Patient D-87681 on the bottom and also Ball 30. It is not round like a lot of them ..kind of boxy. What is it worth? I’m sorry Dorothy. I have no idea. I just collect old jars for my own use. I am not an expert and I don’t know the values. Good luck in your search! Hi Pamela – I’m sorry I don’t know anything about that jar. Maybe someone else here does. Does anyone know of charts, similar to the chart above for Ball jars, for other brands of canning jars? I have found a Boya mason jar. Any idea who manufactured it? I just found a bunch of old clamp down jars in my basement from one of the previous owners. Checking from the chart you listed, it looks like it may be from the 1923-33 range. I also found a bunch of Atlas jars and some that are really pretty but have no name nor do they take a standard size lid, it falls in between a regular and a wide. Thank you so much for posting this! I’ll mention your site in my blogpost on http://thefarmhouseinthefield.blogspot.com/when I talk about the jar discovery I found! I’m excited to have someplace where I can date these. I have a mason jar . Printed on it is Mason then it has CC then a large backwards J then a small backwards j then it says patent Nov 30 1858 do you or anybody you may know be able to get me more research on this ? i just found a blue fruit jar that only has the word “mason” written diagonally on the front. Does anyone know anything about this jar or the company that made it? I have one as well! I can’t seem to find out anything about except my dad has been holding onto it since the 1960’s. I’m not sure if it was my grandmother’s or what. I would love to know if you found anything out! I have an unusual one as well. MASON in all caps on a diagonal with an unusual half underline. It is slope-shouldered and has air bubbles. Definitely pre-1900, but I can’t find it anywhere! Hi! I found your page while looking up my old jars. A frend left them to me when she passed away in the late 90’s. I live in Spain & not much canning is done here, but as an American, I have canned for some years. The jars she left me are Floral Italian Cove wire bale jars. I have been looking for replacement seals here & have had no luck so I started to investigate in the U.S. & have found some. I use the big jars all of the time for Candy, pasta, flour etc. & they have such nice raised designs on them. I never thought they were collectible! I’ll be extra carefull with them now! By the way, the jars are 2 litre. What a wonderful gift your friend left you. I am sure you think of her every time you use them – which makes them extra special. Re the jar with checkboard pattern, is it short and square? Holds maybe a quart? The bare side was probably for a label. I’ve seen them somewhere and have several similar (different pattern molded in 3 sides) which are coffee jars – sold with, I think, ground coffee in them. Guessing 1930s (mine, don’t know about yours). Good luck. I want to thank all for your input. Theresa you are a very special person. I have found that the more I know about something, the more I relies I don’t know, and it takes many trips to the library to get more info. I found the website below just before I found yours. It also lists the logos and years. Hopefully it is ok to share on here. My grandmother just gave me a blue Ball jar that she learned to can with. Appears to be from the 1923-1933 group. My grandmother was born in 1934 so it must have been something her mother already had. Thanks for the link Emily!! How exciting about your grandmother’s jar. That is a treasure. My mom got one of my grandmother’s jars. It is the aqua blue but it just says mason on it. No Ball logo. Any info on one like that? I couldn’t find anything when I searched online. Hey I got a question about a ball jar, I can’t find no pitchers of it and would like to know if you’d have any clue.? Please get back and I’ll put a pitcher of it up. But at has the ball on it in the 1933-1960 but its supper small and near the button edge. This site http://www.sha.org/bottle/ has a ton of information on glass and jar identification and markings. It’s a bit dense to search through, but has a wealth of info. I have a very large volume of old Ball Jars all over 50 plus years old. Most are in the 1923 and below category. I have used some of the glass top with wire seals to presser can green beans and carrots. I have used many of those with new rings and lids. I have never had one to break in the pressure cooker and they seal very good. I have had several of the new jars I bought to break in the cooker. My Dad dug up a St. Augustine River Side Dump prior to his death in 1977. Some of the bottles and jars are as old as 1792. Of course the 1792 is not a Ball. I have a couple dozen, quarts and pints, Ball Perfect Mason, 14J. They have a lead lid, or at least gray colored, ringg and also have a clear glass pieces that fits inside the lid. These quarts and pints are clear. When looking at your diagram, it says 1933-1960. I have looked at the diagrams, and this is the one that it looks to be, but I am wondering how or what the 14J stands for.